Unfortunately time constraints (i.e my day job) keep getting in the way of me updating this site so all Ive been able to do so far for the Sheffield United "Blades" Nickname page is a very basic bit of background. 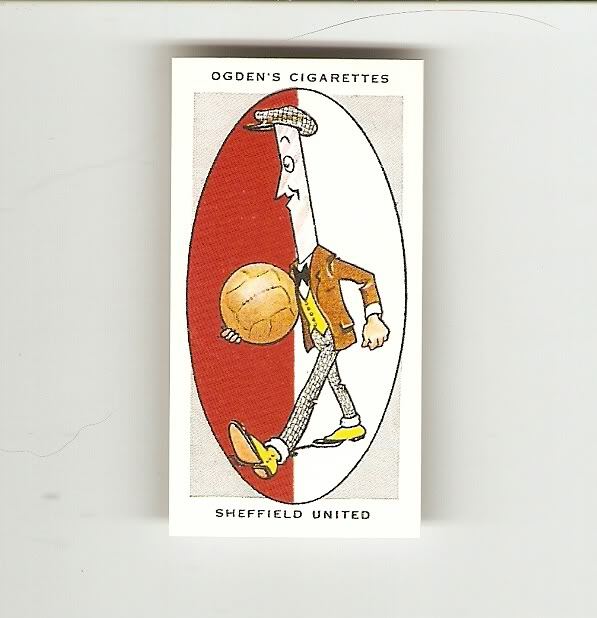 Ive shown below a football cigarette card from the Ogdens AFC Nicknames series that features a caricature of a knife with a football which of course depicts Sheffield Uniteds "Blades" nickname !! "Sheffield United take their nickname, the “Blades”, from the cutlery trade of the city, and on many occasions they have lived up to it in their sharpness in pursuit of victory. The club, which was founded in 1889, was an offshoot of the cricket club which then played at the Bramall Lane ground, and there has been an unbroken association between the sections. Famous as cup fighters, they have won the trophy four times. Their one success in the League was as long ago as 1898. Many famous players have been members of the side, one of the most notable being Ernest Needham, who was described as the “Prince of half-backs”. When at his best Needham had no rival for a place in the England team". So there you are, a very brief overview of Sheffield Uniteds "Blades" nickname, theres a bit to expand on yet though so I will come back to this page shortly.